Perhaps the title of this post has made you decide to skip it. I hope not, but I can't promise much. Let's see if I can make something out of nothing. Below is the progress of the Kimono Shawl from Cheryl Oberle's Folk Shawls. This has become my in-between project that I work on mostly in between other, more engrossing projects. It is now just under 30 inches long. I have two balls of Jaeger Zephyr Spun wool/silk (about 1,200 yards) and 1,500 yards of Henry's Attic Petite Cascade silk. It looks like this quantity will make a long enough shawl. I wanted to buy more Zephyr Spun, but the Mosaic Yarn Studio only had two balls. The clerk assured me that 1,200 yards was plenty for any shawl. She is no doubt right, but I prefer to have too much just in case. This shawl will be perfect for warm weather. I don't expect to make many more lacey shawls for myself. Solid wool ones like the Wool Peddler are more practical, although I do love Oberle's Bird's Nest shawl as well. April is the month when I should begin my Christmas gift project, that is if I do one this year. In 2006 I made around 15 scarves as presents for everyone at work and other friends. It was a large but satisfying undertaking. I learned a lot about yarn and knitting techniques by doing it. That project was, in fact, the inspiration for this blog, because I wanted some place to show off. (This was before I got on to Ravelry.) I skipped 2007. That is, I only made a few of my presents from that year. But I promised myself that I would do a big project for 2008. My first thought was socks. Hence my sock experiment from the previous post. I do love my socks, but I realized that fit is crucial in sock knitting. I wore my socks for the first time yesterday. They are wearable, but too big. I would have to know the foot measurement of every recipient to make them socks that they would really like, and that will not do. I want it to be a surprise. So here is what I am thinking now: mittens. Fit is not that important in mittens, and everyone can use a pair for really cold, snowy conditions even if they don't wear them regularly. I would make gloves, but I fear the fingers. Maybe next year or 2010. Elliphantom also has a free squirrel pattern, and Hello Yarns (inventor of the Irish Hiking Scarf) has a skull and crossbones. 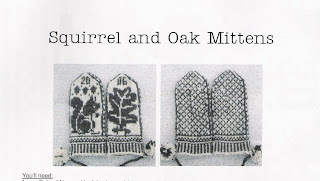 And of course, being obsessed with knitting books as well as knitting, I am getting Folk Mittens to complete my collection of the Interweave press Folk series. The only one left to go after that is Folk Knitting in Estonia. So, am I committed to mittens now? I guess so. Thanks for visiting my blog. And I am too ambitious with five projects going and should know better. It doesn't work for me either. Oh yes, I love mittens (so came to see what yours will be) but have gotten specific requests for fingerless gloves from the kids. 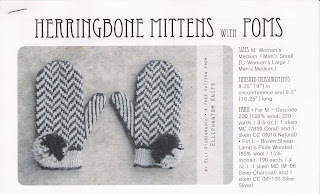 As a young mother I made lots and lots of mittens and pompom hats and would still be doing so except for the lack of grandkiddies and small family members. Have a good time with your knitting. I love to see what other knitters are up to. I really like your idea of planning Christmas gifts and the idea of a theme. You have inspired me to create a plan, not just go along willy-nilly. I just started a Rambling Rows afgan for granddaughter #1 with Christmas in mind but I am going to get more serious about a plan. Thanks!